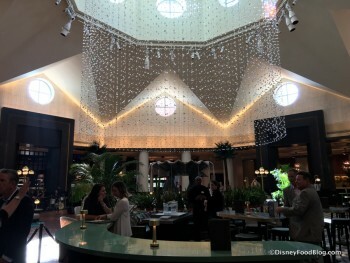 Phins is the striking lobby bar in the newly renovated lobby of the Walt Disney World Dolphin of the Swan and Dolphin Hotels in the Epcot Resort area. Enjoy craft beers, wine (including on tap options), specialty cocktails and globally-inspired appetizers in this stunning space. Hours of operation are 12:00 pm – 2:00 am Monday – Saturday, and 10:00 am – 2:00 am on Sunday. Famous Drinks/Dishes: Smoke ‘n Roses, a smoking bourbon drink!